Why investors could see more gains ahead for these market darlings. Share price spikes happen for any number of reasons -- the most frequent catalyst being simple stock market noise. When a stock outperforms broader indexes by a wide margin over time, though, it's usually due to a real improvement in its earning power. That, in turn, can point to solid gains ahead for investors even following a big stock price run-up. With that in mind, today I'll highlight three stocks, Activision Blizzard (NASDAQ:ATVI), Ulta Salon (NASDAQ:ULTA), and Tyson Foods (NYSE:TSN), that are each up by 55% or more in the last year, and I'll discuss whether growth has peaked. World of Warcraft, Call of Duty, and Skylanders, three of Activision Blizzard's biggest video game franchises, are all expected to post weaker results in 2016. And yet management is projecting a record fiscal year ahead. What gives? Two big trends are powering growth for this video game developer. First, its portfolio of entertainment content has improved with recent high-budget additions Destiny, Hearthstone, and Heroes of the Storm. The King Digital Entertainment acquisition also makes Activision an instant force in mobile gaming. Overall, its base of 500 million active users provides diversity that it couldn't claim a few years ago when just three titles were responsible for nearly all of its earnings. Second, Activision is reaping major financial rewards from digital selling. The online spending shift has boosted profit margins by cutting out middleman retailers, but it is also turning video games into cash machines whose lifetime values rise thanks to rounds of expansion packs and millions of microtransactions by gamers. Investors have reacted to all this good news by pushing Activision's valuation to 25 times earnings from a 15 P/E two years ago. That's still a good deal, in my opinion, considering the company's massive base of highly engaged users and many opportunities to leverage its entertainment properties. Few retailers can claim anything close to the success that Ulta Salon has had in attracting customers lately. Comparable-store sales growth soared to an all-time high of 15% last quarter, trouncing executives' 10% forecast. The gains were powered by surging customer traffic and greater average spending by shoppers. Gross profit margin also hit a new high at 36% of sales. Combined with the revenue boost, that profitability bounce translated into 40% higher earnings. "We are off to a phenomenal start to the year," CEO Mary Dillon told investors in late April. Ulta is grabbing more than its fair share of industry growth, and that streak looks set to continue due to the company's highly successful loyalty program and a unique salon-focused retailing format. But investors have to balance that bright future against important risks. Dillon and her executive team are aggressively expanding the store base, for one, and there will be a temptation to pick less-than-optimal sites in the name of striking while the iron is hot. Meanwhile, the stock's P/E ratio of 40 times this year's earnings doesn't leave a lot of room for big gains even if the beauty services industry continues expanding rapidly. Packaged meat products can be a lucrative business -- if you have the right brands to go along with a killer operating strategy. With franchises like Jimmy Dean and Sara Lee, Tyson Foods has controlled the brands, but its business has been hostage to price swings in its key segments of chicken, beef, and pork. That vulnerability is starting to disappear. Despite an average drop of 4% in chicken prices over the last six months, Tyson produced 3% higher profits in the segment. "We've fundamentally changed how we operate our chicken business," an executive told investors last month. "We've taken more than $1 billion in inefficiencies out of the business since 2009." TSN Gross Profit Margin (TTM) data by YCharts. 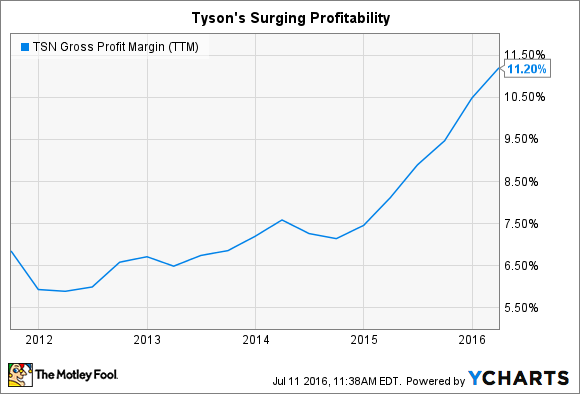 The proof is in the bottom line, where Tyson's margin has soared from 5% to 8% of sales so far this fiscal year. The stock's valuation has jumped to 19 times earnings from a P/E ratio that was below 16 for much of the last few years. There's more room to run, though, if the company has succeeded in protecting itself from commodity price swings and can keep its product pipeline full of in-demand meat products.